The place: This eco-friendly salon is fairly bare-bones, with teal walls, a few vintage birdcages, and a product-refilling station where customers top off empty bottles of shampoo and conditioner. What we were after: We were open to suggestions—as long as they would remedy an uneven, overlayered cut that left our hair frazzled. What we got: Using long-bladed scissors, Dominguez did away with our wrecked ends and suggested flirty ­Brigitte Bardotlike bangs. Bottom line: We walked in with our hair hidden in a messy knot, but after Dominguez rescued our botched cut, we were excited to show off a healthier, sexier style. An earth-first philosophy is migrating from the fringes to the mainstream, as internet-educated and social-media savvy consumers are demanding salon products and service that they consider safer for themselves, their families and the environment. While some skeptics see marketing hype prompting an undeserved panic, others feel that going green makes good sense. 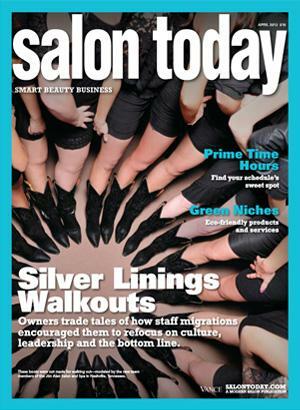 But what does it mean for the salon owner? “I am not sure if consumers are more environmentally conscious or that they are beginning to see the repercussions of past consumer behavior, but what I do know is they are now being given a large selection of choices. And, with more choices available, they are opting for eco-friendly products,” says Gina Dominguez, owner of the Bird’s Nest in Chicago, an alternative salon dedicated to green living and wellness. Use Me! Products, an eco-chic hair care line, has found a soft landing at Bird’s Nest where their “refill, reuse, repeat” philosophy aligns with Dominguez’ own. For two months, 3131 W. Logan Blvd. had nothing more than an intriguing image in its storefront. Now with a company sign and bird cages lining the upper window pane, it is Logan Square’s first eco-friendly hair salon, The Bird’s Nest (@birdsnestsalon). Above three black chairs, hair dryers hang from the ceiling in a neat row, not only creating a beautiful façade, but also emitting low-electricity light. Seeking refuge from the dreary Sunday morning, I found it in the warm, robin colors on the wall, the fresh pot of coffee being poured into my cup and the inviting nature of the three brunettes, who comprise the salon’s full-time staff. Throughout history, the products used to beautify actually cause damage. With health-conscious and green-friendly living sweeping the nation, synthetic products have become more taboo, as organic ones have become a more viable and appealing option. Inspired by this growing popularity, master stylist Gina Dominguez took a blossoming fad and turned it into a practice. As a long-time Logan Square resident, Dominguez saw the building as the perfect location to create a space that inspired people to give back to the community and be responsible for the decisions they make and how they affect the world we live in. Rather than opt to carry popular organic and eco-friendly brands such as Aveda, Dominguez wanted to explore how companies were embracing sustainable living, starting with the product lines she carries and how they’re dispensed. Instead of selling products that cause waste, the Bird’s Nest invested in a refilling station. One of the main product lines, Use Me is the first one to create and implement the idea. Use Me supplies The Bird’s Nest with pumps so that when clients have finished their products, they can come back to the salon and purchase them sans packaging. Dedicated to expanding sustainable practices, The Birds Nest is the first eco-friendly salon to offer this line within Chicago. They also carry the PETA-approved line Onesta. Originally an innocuous practice where Egyptians used the henna plant to conceal their grays, the hair dying process today uses pungent, damaging chemicals that transform hair into shades of copper red and golden blonde, but at a cost. Over the years, the hair industry has responded to customers’ requests to carry eco-friendly products that still provide plentiful options beyond henna’s limited effects. At The Bird’s Nest, the stylists found that transforming your hair doesn’t have to be toxic, in fact they prefer it not to be. They found when you subtract toxins, add delicious ingredients such as sandalwood and jasmine found in the So Pure by Keune line, you not only provide a sensuous experience for the scalp, but a healthy experience for your entire head of hair. Stylists recommend getting a haircut every six to eight weeks for women and every three to four weeks for men. Choose from two full-time stylists, a part-time stylist specializing in ethnic hair and a stylist that accommodate kid’s haircuts every Wednesday. Offering the only ethnic stylist in the neighborhood and the only salon in Chicago to use a refilling station, The Birds Nest is a truly unique addition to Logan Square.